Cort (80) Litchford finds a hole in the defense. Cannon County's youth football programs will be well represented in postseason play with two teams playing beyond the regular season. The JR Lions finished the season strong and secured a bowl game by virtue of their 14-12 win against Celina in the regular-season finale. The JR Lions will play host to Pickett County Saturday at Schwartz Field at 3:30 p.m. The Cannon County Youth Football Lions, 8-9 year-olds, also have extended their season and will face Watertown in the first round of the playoffs at Clay County Saturday at 1 p.m. The championship and consolation games will be played Oct. 23. The Youth Lions had to fight their way into the playoffs and earned a spot by virtue of a 25-6 win against Hartsville in the regular-season finale. Weston Hargrove and Gabe Elrod had solid all-around games and have been vital cogs in the team's success throughout the season. Strong play from the offensive line was on display as Hargrove and Elrod had plenty of room to roam. Cameron Diggs closed the regular season in style when he scored his first touchdown of the season. The defense has been a strong suit and will be counted on against Watertown. 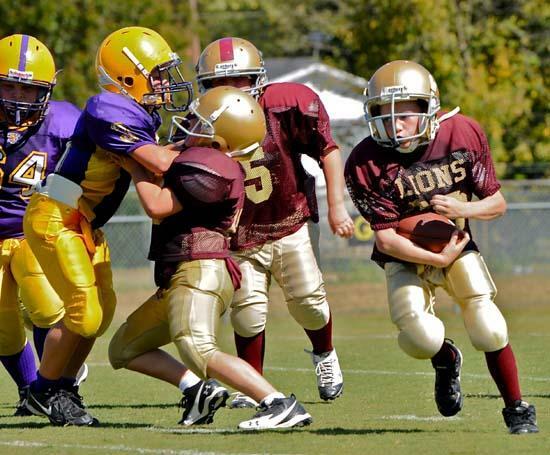 Blake Farless and Johnny Yourgelitis have been defensive leaders for the youth Lions.